The Dynaplug Tubeless Bicycle Tire Repair tools come in several models: the MICRO PRO ($54.99) and the CARBON ULTRALITE ($21.99). Both of the tools repair a bicycle tire by inserting a repair plug in the puncture location. The repair plug bonds with the tire rubber; no glues are needed. More than one repair plug can be used to seal the hole. The Micro Pro tool has the style of a small capsule to keep it very small, and still all of the accessories are stored neatly inside and weighs only 1.5 ounces. With this tool, there are five repair plugs along with two insertion tubes, an air stopper and a micro knife. The Carbon Ultralite is has a hollow handle that can store extra items. It comes with one insertion tube and four repair plugs. Both tools use the same repair plugs; extra insertion tubes, micro knife and air stopper are available directly from Dynaplug. Tire repair plugs come in packs of 5. Both of these tools are easy-to-use, neat and fast, have a LIMITED LIFETIME WARRANTY and are MADE IN THE USA. ABOUT THIS PRODUCT: Made in USA. One plug seals a hole with a diameter as large as 3/16". Use more plugs as needed. Carried, tested and used by riding atheletes around the world. 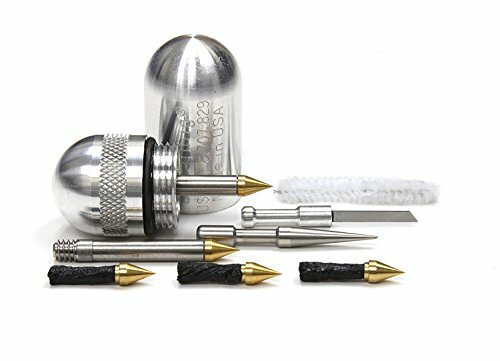 INCLUDED IN THIS DEAL are 10 pieces: Tool + (5) Tire repair plugs (pointed tip), (2) Insertion tube with preloaded repair plug, (1) Micro Knife, (1) Air stopper. Machined from 6061 aluminum billet. USE: For fast puncture repairs without using glue, patching, or removing the tire! DIMENSIONS: Is just 2.25" x .875" and weighs 1.5 ounces. COMPANY INFO: Dynaplug is a US company based in Chico, California. If you have any questions about this product by Dynaplug, contact us by completing and submitting the form below. If you are looking for a specif part number, please include it with your message.